My childhood was filled with family friendly movies.Â My mom was big on them, so even to this date, there are movies which were a pivotal part of the childhoods lived around me that I have yet to see.Â But some of the great and hilariously campy movies my siblings and I watched when we were young completely make up for it.Â There was the one we called Bang! Bang!, the one about the magic flute, the guy who turned into a seal (I think that’s how the plot went) and a whole bunch of other great ones.Â Now there’s one more to join that elite pantheon and it’s ready right now. Starting this May 5th, now available on DVD from Fairplay Pictures and Paramount Studios Home Entertainment comes the latest and greatest in family friendly entertainment.Â A Plumm Summer is ready to come hopping right out of your television screen and bring a funny and moving story into your living room that the whole family can enjoy.Â Bring home this great choice for you and the ones you love today! Inspired by a true story, this movie is the story of a small town that is rocked when their famous TV puppet Froggy Doo is kidnapped.Â Now two young brothers, Elliot and Rocky Plumm, are determined to track down the frog and save the day.Â The team up with their new neighbor, Haley, to bring about this success.Â Along the way, they will have to become friends and avoid the FBI who have somehow become involved.Â Will they possibly be able to save Froggy Doo?Â This movie stars William Baldwin, Henry Winkler, Lisa Guerrero, Brenda Strong, Owen Pearce, Morgan Flynn, Peter Scolari, Rick Overton, Tim Quill, Chris Massoglia and is narrated by Jeff Daniels. The special features included in this DVD are an optional audio commentary from writer/director Caroline Zelder and writer/producer Frank Antonelli, a great gag reel, some nice deleted scenes, the original theatrical trailer, a behind-the-scenes music video and a look behind the scenes on the red carpet for the movie premier. When I saw that there was a Baldwin brother in this family friendly movie, guess who I assumed it would be?Â You’re right, I thought it was Steven.Â Imagine my surprise to find that it was actually Billy, my second favorite of the clan, right behind Alec.Â Although it was strange to find Billy here, after his performance in The Squid And The Whale, he can do no wrong in my eyes.Â When I saw Henry Winkler was in it, I prepared myself to be completely disappointed.Â His choice in movies has been a little lackluster to say the least.Â Yet I ended up truly enjoying this movie.Â It’s funny, it’s heartwarming and it is genuinely interesting.Â All of the actors do a great job, although I personally would never risk anything to rescue Froggy Doo.Â That’s one strange looking puppet â€“ like something Jim Henson dreamed up for Labyrinth, but decided it might scare even David Bowie, so he left it out.Â All in all, it was a good movie and would make a great choice for a family night in. This movie is Plumm fantastic! 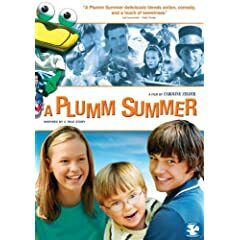 No user commented in " Movie Review: A Plumm Summer "